Dupuytren’s contracture is a condition which affects the hand and fingers, causing the fingers to bend in towards the palm of the hand. Tissue in the hand contracts and becomes shorter, although this does not normally cause pain. Many cases do not require treatment, although if the condition is severe, there are options you can take. One or more fingers will appear contracted and bent towards the palm of the hand. Usually, one finger curls in first and over time are followed by others. Dupuytren’s contracture is not usually painful although small nodules may develop in the palm of the hand where the skin may also appear thickened. Dupuytren’s contracture occurs when the tissue of the palm of the hand contracts and becomes permanently shortened. As the tissue further contracts, it becomes difficult to extend the fingers and fully open out the palm of the hand. It is a relatively common condition, affecting around 20% of men over the age of 60 and is slightly less frequent in women. Dupuytren’s can affect one hand only or both hands at the same time. Causes include genetics. Up to 70% of people who develop Dupuytren’s contracture have a family history of the condition. The most common group of people to suffer from this condition are white males over the age of 40. Diabetes is a common risk factor and epilepsy may also be linked to the condition. High consumption of alcohol or tobacco may also be associated with developing Dupuytren’s contracture. 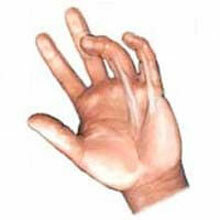 Treatment of Dupuytren’s contracture will depend on the severity of the condition. Many mild cases may not require any treatment at all. Where the condition is restricting the athlete’s ability to train or perform then physical therapy may be used, although its effectiveness is yet to be proven. Treatments include manipulations, sports massage, ultrasound, and hydrotherapy. The only effective treatment for more severe cases is surgery. This involves either a fasciotomy where the connective tissue is cut or a fasciectomy where it is removed altogether. Fasciectomy is usually reserved for those with more severe or recurrent cases.